Imagine a year ago hearing that the next pope would be a well-liked man with near-celebrity status to Catholics and non-Catholics alike. It would have been hard to believe. The Catholic Church was in a bad place, receiving mostly negative press with story after story in a massive child abuse scandal. The 2,000-year-old church needed a way to move past its bad reputation and stay relevant in the 21st century. It seems Jorge Bergoglio, the former head bishop of Argentina, was their answer. He is certainly something different—the first-ever Latin-American pope and the first non-European one in 1,300 years. 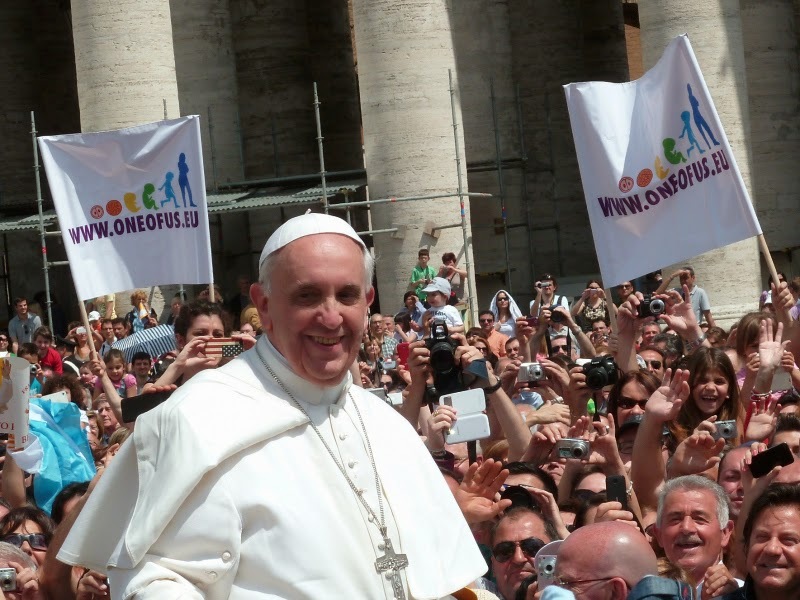 Beginning his papacy in March of 2013, he gave himself the name Francis. This choice (another first for a pope) signified his intention to live modestly, as Saint Francis of Assisi did. So far, he’s living up to the name. Pope Francis is known for putting actions before dogma, others before his own recognition, and—most importantly—for being different. He behaves so unlike former popes that the world can’t help but notice him. The things he says and does inspire warm reactions even from non-religious people. This popularity has inspired t-shirts, mugs, and shot glasses featuring his likeness. He was even named Person of the Year by Time magazine in 2013. Though he may seem like an unlikely candidate to lead the Catholic Church, he was the right fit for many reasons. He is known for living modestly, speaking from the heart, and consistently placing himself among his followers rather than above them. For a church sliding into irrelevance and most commonly associated with an awful scandal, these qualities were desperately needed. Since the start of his papacy, he’s made some groundbreaking changes. He chose not to live in the Apostolic Palace, but instead in small quarters in a Vatican guest house. He wears modest garments rather than custom-tailored expensive robes as former popes have. He rides around Rome in a Ford Focus, not the papal limousine. When asked about gays in the church, he (now-famously) responded, “Who am I to judge?” But the answer to that question is: the Pope. He’s the person most people expect to—and sometimes even look to—to judge. And though he’s a man in a singular position of influence, he’s choosing to wield it differently. On this issue at least, Pope Francis isn’t telling his one billion devotees to throw stones. He’s asking a simple question with a lot of weight. “As long as they are acting in love, seeking the Lord,” he said, “who am I to judge?” It’s nothing that hasn’t been said before by many other people, but from a pope, it’s powerful. And the changes he’s making are mostly positive. In some areas, though, he is making judgment calls. And not everything he says is in line with liberal views. "It is not 'progressive' to try to resolve problems by eliminating a human life," Pope Francis has written. And while he doesn’t dwell on abortion, it’s clear where he stands. His face may be on iPhone covers and shot glasses, but he is still a pope. He’s not changing the rules to allow women to become priests, he believes abortion should be illegal, and he hasn’t changed the church’s stance on gay people’s right to get married. He’s not progressive. But maybe the most one can expect from one of the oldest and largest religious organizations in the world is only progress. And it is progress. From the pope, a man whom one billion people recognize as their religious leader, it’s about as much as a forward-thinking world can hope for.